Christian is a Principal Consultant at FuseSource specializing in developing enterprise software applications with an emphasis on software integration and messaging. His strengths include helping clients build software using industry best practices, Test Driven Design, ActiveMQ, Apache Camel, ServiceMix, Spring Framework, and most importantly, modeling complex domains so that they can be realized in software. He works primarily using Java and its many frameworks, but his favorite programming language is Python. He's in the midst of learning Scala and hopes to contribute to the Apache Apollo project. So you’ve decided to run your Kubernetes workloads in AWS. As we’ve seen before setting up AWS EKS requires a lot of patience and headache. You may be able to get it working. For others, you should check out the eksctl tool from Weaveworks. Now that you’ve got a Kubernetes cluster, you want to start deploying your microservices to it and start exposing and integrating APIs and services to your clients and other parts of your organization. 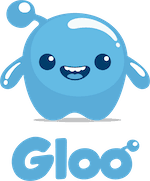 At Solo.io we’ve open-sourced a microservices gateway built on top of Envoy Proxy named Gloo. Gloo is a platform agnostic control plane for Envoy purposefully built to understand “function” level calls (think combination of HTTP path/method/headers, gRPC calls, or Lambda functions) for the purposes of composing them and building richer APIs for both north-south AND east-west traffic. Gloo is also highly complementary to service-mesh technology like Istio. On Gloo, we are also working on native OpenShift support and should have it shortly. 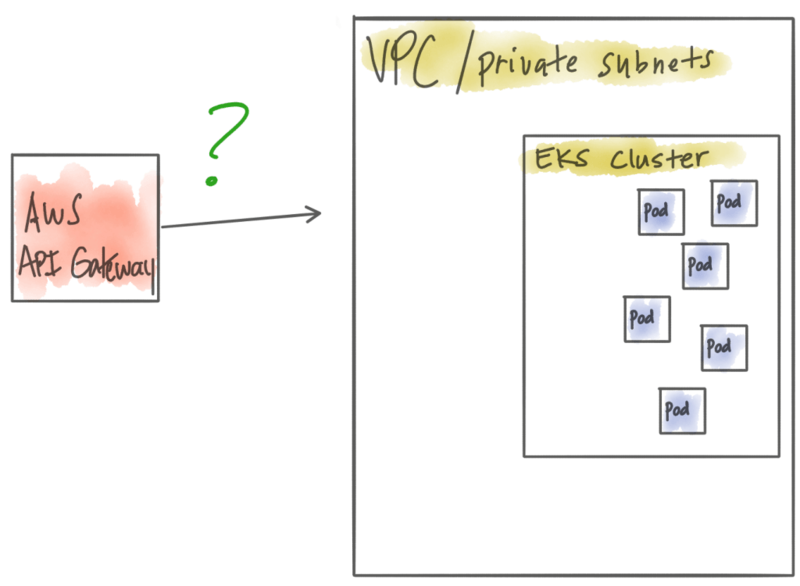 In the meantime, if you’re running workloads on AWS EKS, you may have some questions about how to leverage a microservices gateway or whether you should just use the AWS managed AWS API Gateway? Let’s explore the options here. 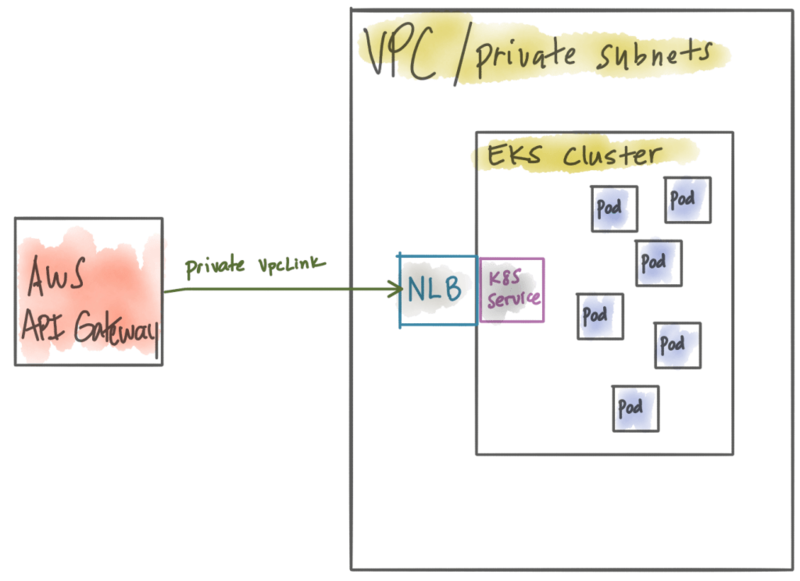 AWS EKS is really a managed control plane for Kubernetes and you run your worker nodes yourself. 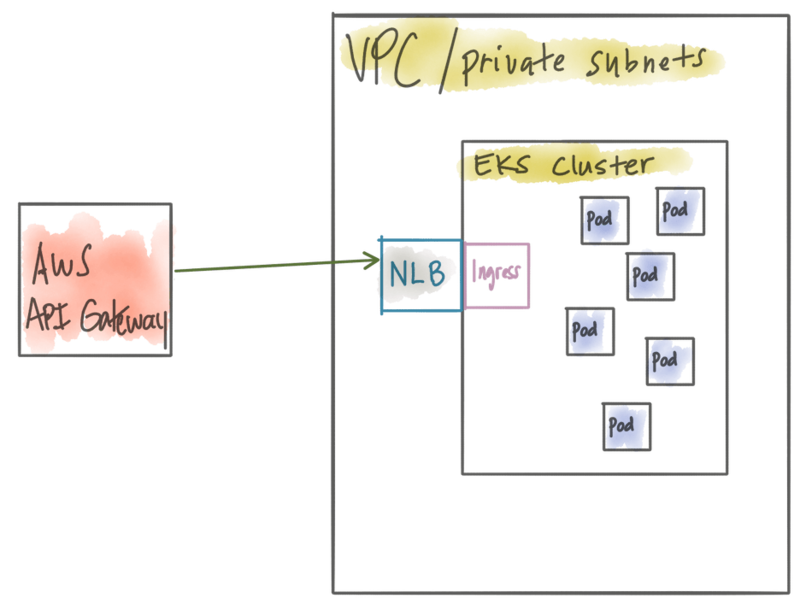 A typical setup is to have your worker nodes (EC2 Hosts) in a private VPC and using all of the built in VPC isolation, security groups, IAM policies, etc. Once you start deploying workloads/microservices to your Kubernetes cluster, you may wish to expose them and/or provide a nicely decoupled API to your clients/customers/partners, etc. Your first question is probably along the lines of “well, since I’m using AWS, it should just be super easy to use the AWS API Gateway in front of my Kubernetes cluster”. As you start to dig, you realize it’s not exactly that straight forward to connect AWS API Gateway to your EKS cluster. What you find is AWS API Gateway runs in it’s own VPC and is completely managed so you cannot see any details about its infrastructure. Luckily, with AWS API Gateway, you can do “Private Integrations” to connect to HTTP endpoints running in your own VPC. Private Integrations allow you to expose a Network Load Balancer (NLB) in your private VPC which can terminate traffic for your API Gateway to VPC integration. 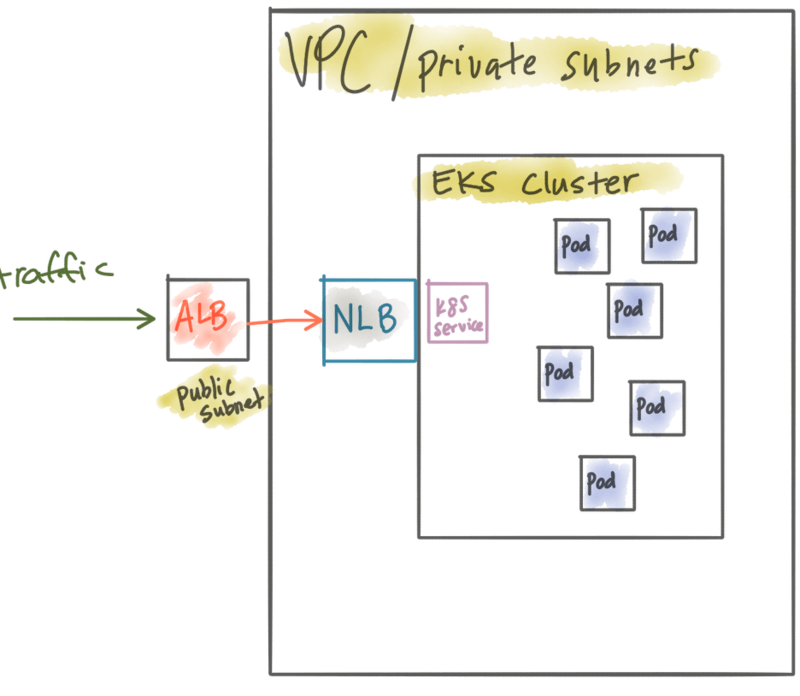 So basically the AWS API Gateway would create a VpcLink to a NLB running in your VPC. At this point, we have the correct combination of load balancer (NLB in private VPC) and AWS API Gateway configured correctly. We can even have AWS web application firewall (WAF) enabled on the AWS API Gateway. The only problem is, we have the power (and cost) of the AWS API Gateway at the edge, but it still doesn’t understand the workloads we have running within the Kubernetes cluster. When we want to do things like canary releases, API aggregation, function routing and content transformation, we need to do that within the Kubernetes cluster. Gloo solves for that. So do you really need API Gateway -> NLB -> API Gateway? In this case, you could just promote your network load balancer to a public subnet, let Gloo handle all of the API Gateway routing, traffic shaping, rate limiting, and not lose any of the functionality of the AWS API Gateway (Lambda routing, AuthZ/N, Websockets, etc). 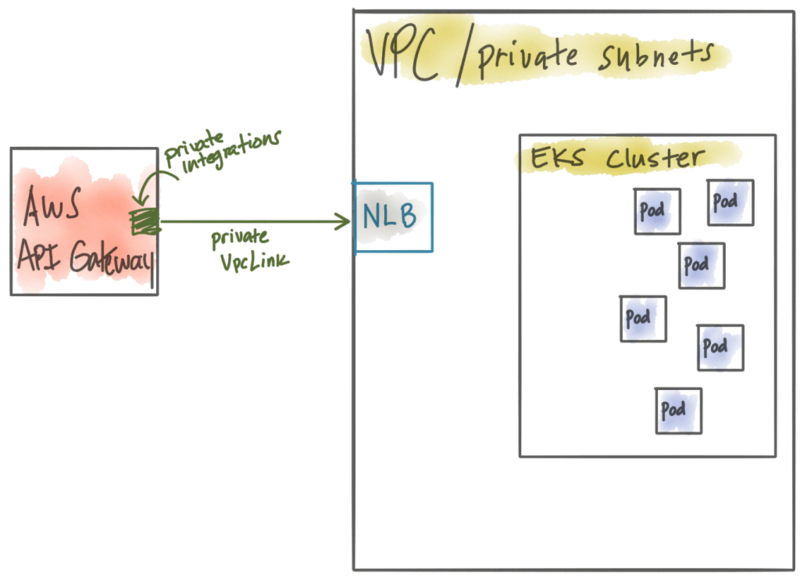 We started the previous section with an assumption that an AWS API Gateway would be simpler to integrate with our Kubernetes cluster when using EKS than an alternative solution. We found that’s not the case. We do have other options, however. If you’re using EKS, you’ll need some sort of API gateway or microservices gateway that runs within Kubernetes. 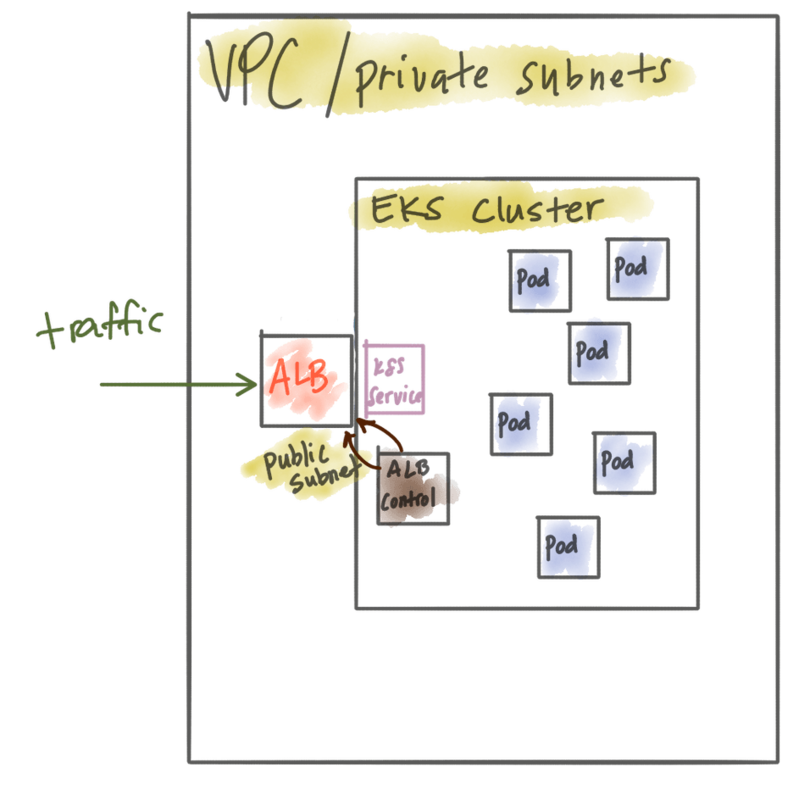 But how do we get traffic to our EKS cluster? And what if we want to take advantage of things like the AWS Web Application Firewall (WAF)? This is the usecase from the previous section. Now you’ve gained the power of a microservices gateway closer to the workloads in EKS, but you’ve got a redundant and expensive gateway at your edge. The benefit here is you still can take advantage of AWS web application firewall (WAF). In this case, we’ve eschewed the AWS API Gateway and are just using a network load balancer sitting in a public subnet. All of the power of the microservices/API gateway now sits close to your workloads in EKS, but you lose the web application firewall (cannot be applied to NLB). If you have your own WAF you’re using, this may not be a bad tradeoff. You can use the Kubernetes Ingress with Application Load Balancer 3rd-party plugin to manage your ALB in Kubernetes. At this point you can run your API Gateweay locally and privately within your EKS cluster and still take advantage of WAF because we’re using an ALB. The downside is this functionality is provided by a third-party plugin and you cannot centrally manage your certificates with cloud formation. That is, you have to use the Ingress annotations to manage those. There are a handful of options to run your microservices/API Gateway in AWS EKS. Each combination comes with tradeoffs and should be carefully considered. We built Gloo specifically to be a powerful cross platform, cross-cloud microservices API Gateway. This means you have even more options when running on AWS, on premises, or any other cloud. Each organization will have their unique constraints, opinions, and options. We believe there are good options to make a monolith to microserivces or on-premises hybrid deployment to public cloud a success. If you have an alternative suggestion for this use case, please reach out to me @christianposta on twitter or in the comments of this blog.